Contains very high antioxidant level of 12.05% vs 5-6% for mass-market teas. 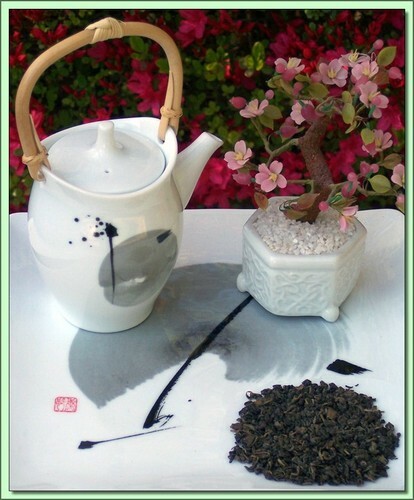 Character: A new season green tea with surprising body and captivating taste. This tea is a classic top quality Gunpowder (marked as 'Osprey' the high soaring bird of prey, the pinnacle) with solid taste properties - slightly vegetative but refreshing and clean. Superior quality gunpowder comes from Zhejiang. This tea is from a tea estate west of Hangzhou in the hill country of that province. The green leaf is plucked during April, at the time of best quality. Legend is the name Gunpowder was given by a young English clerk who thought the tiny rolled green balls looked like gunpowder. The Chinese name is Siaou Chu, which literally means large leaf. Rolling the leaf has two effects on tea quality. It forces flavorful juices to the surface that otherwise would remain in the leaf. Rolling also forces out water, helping to reduce the tea's final moisture content. The pellet retains its shape during firing and keeps its freshness longer than tea not manufactured in pellet form. Organic tea is produced without the input of chemical fertilizers or pesticides and herbicides. Certified Organic by QMI Organic Inc. Certificate #: 150 - 2008. USDA Certified Organic. Hot Tea: This tea is best enjoyed by pouring 180F/90C water over the leaves (1 tsp per cup) for 1-3 minutes (longer=stronger). Don't remove the leaves. Can be infused repeatedly 2-3 times using higher temperatures & shorter infusions until flavor is exhausted.